Luis David Perdomo…all-time favorite baseball players are David Ortiz and Pedro Martinez...enjoys any movie Vin Diesel is in...originally signed by the St. Louis Cardinals as a non-drafted free agent on November 28, 2010. Split the campaign between El Paso (AAA) and SD, missing 33 games with a strained right shoulder...His first nine appearances of the season for SD were all starts, and upon his return from the DL on 9/3, he made two relief appearances and one start for his final outing on 9/26 at SF ... Posted a 1-6 record in 10 starts, owning a 7.38 ERA (35 ER, 42.2 IP) with a .335 opponent AVG...in his two appearances as a reliever, had a 0.00 ERA (0 ER, 2.0 IP) and a .143 opponent AVG...To begin the season, made four starts with the big-league club from 3/31-4/18, going 1-2 with a 8.36 ERA (13 ER, 14.0 IP) before being optioned to ELP...made 11 starts for ELP and allowed two runs-or-fewer in seven of his 11 outings...Recalled from ELP on 7/4 and made five starts from 7/4-22, going 0-4 with a 7.71 ERA (6 ER, 2.1 IP)...Placed on the 10-day DL with a right shoulder strain on 7/28 and was reinstated on 9/3...made two scoreless relief appearances (9/8 at CIN and 9/22 at LAD)...Tossed a first-pitch strike 63.0 percent of the time, the highest percentage in his career at the ML level...Both his HR percentage (1.84) and his HR/9 IP (0.81) were the best marks he posted in a single season... allowed four HR after facing 217 batters...Posted a 2.25 ERA on the road (6 ER, 24.0 IP) compared to a 12.63 ERA at home (29 ER, 20.2 IP)...his career 6.23 ERA since 2016 finished as the highest among all qualifying ML pitchers...Relied on five pitches sinker (45.5%), slider (26.5%), four-seamer (16.6%), split finger (11.4%) and curve (0.1%). Set career highs in nearly every category in 2017 and ranked tied for the club lead in quality starts (16), tied for second in wins (eight), third in innings pitched (163.2) and fourth in strikeouts (118)... Led all NL pitchers with a 62.0 ground ball percentage, trailing only TOR's Marcus Stroman (62.9) in the majors...his 321 ground balls induced ranked fourth in the majors behind teammate Clayton Richard and Stroman's 377 and STL/SEA's Mike Leake's 326... Forced opponents to ground into 32 double plays, which ranked tied for first in the NL with teammate Clayton Richard and tied for second in the majors behind only Stroman's 34, despite throwing 37.1 innings less than Stroman…his 1.76 opponent ground GIDP/9 IP ratio ranked first in the majors... Became the first pitcher to hit four triples in a season since PHI's Robin Roberts in 1955…only three other pitchers had one triple in MLB in 2017, resulting in Perdomo having more triples in his 46 at-bats than all other MLB pitchers in their combined 4,534 at-bats... Strung together four quality starts from 4/28-5/15 and posted a 3.00 ERA (8 ER, 24.0 IP) with 26 SO to 6 BB... 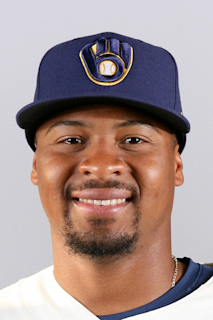 Recorded two extra-base hits for the first time in his career on 5/15 at MIL…his RBI triple in the second inning was the first triple of his career and he became the first Padre hurler to hit a three-bagger since Tyson Ross on 6/20/15 at ARI... With six no decisions to open the season, he had the most consecutive starts to begin a season without a decision in club history, surpassing Bob Owchinko's five consecutive starts in 1977 (STATS Inc.)... Tossed at least 6.0 IP while allowing two hits or less and no earned runs twice (5/31 vs. CHC and 6/23 vs. DET), one of only two Padres to record such an outing in 2017 (also, Jhoulys Chacin, 9/23 vs. COL)... Earned his first win in his 11th start of the season on 6/12 vs. CIN, working 6.2 innings of three-run ball…after going winless in his first 10 starts, only John D'Acquisto (12 starts without a win in 1977) has ever had a longer winless streak to start a season in Padres history (STATS)... Earned the win in three straight games (6/23-7/5), the longest such streak of his career and one of only three Padres to do so in 2017 (also: Chacin 7/20-8/1 and Lamet 7/23-8/5)…went 3-0 with a 2.76 ERA (5 ER, 16.1 IP)... Tossed at least 6.0 IP in 10 consecutive starts from 7/22-9/10, the most by a Padres hurler since James Shields tossed 6.0-plus innings in 14 straight from 9/9/15-5/25/16... Worked 5.0 innings-or-more in 26 of his 29 starts and 6.0 innings-or-more in 20 of his starts in 2017. Set career highs in nearly every category and led all Padres starting pitchers in 2016 in wins (nine), innings pitched (146.2) and ranked second in strikeouts (105) and games started (20)...Tossed the only complete game by a Padres pitcher this season on 8/28 at Miami, working 9.0 innings of one-run ball, allowing six hits and three walks while striking out three in the team's 3-1 victory…induced five double play ground outs in the game...Became the first Padres rookie to toss a complete game since 2008 when Josh Banks did so on 5/31/08 at SF...Gave up three earned runs or less in 12 of his 18 starts after 6/15 and earned a quality start in 10 of his 20 starts on the season...Came in relief on 6/10 at COL and worked 5.2 innings, striking out seven…tying the second-longest relief outing in the Majors this year and the longest by a Padre reliever since Tim Stauffer also went 5.2 innings on 5/22/13 vs. STL...Worked scoreless ball in five of his 15 relief appearances with a 9.10 ERA (30 ER, 29.2 IP)...Made his Major League debut in the Padres first game of the season on 4/4 vs. LAD, allowing six earned runs in 1.0 inning pitched...Earned his first career win on 4/16 vs. ARI with a scoreless inning pitched in the Padres 14-inning win that night...Made his first career start on 5/14 at MIL, working 2.0 innings allowing two runs on four hits and two walks while striking out four in the team's eventual 8-7 victory...Earned his first career win as a starter against the Marlins on 6/15, working 6.0 innings allowing three runs on six hits and two walks while striking out four in the team's 6-3 victory...Over his 10 outings in July and August, went 5-4 and posted a 3.59 ERA (25 ER, 62.2 IP) with six quality starts. Set career-highs in nearly every category, going a combined 6-12 with a 3.98 ERA (56 ER, 126.2 IP) and 118 strikeouts against 37 walks over 23 games, 22 starts, between Single-A Palm Beach and Single-A Peoria....Began the season with Peoria and went 5-9 with a 3.68 ERA (41 ER, 100.1 IP) and 100 strikeouts against 31 walks in 17 starts before earning a promotion to Palm Beach in August....In six games, five starts, for Palm Beach went 1-3 with a 5.13 ERA(15 ER, 26.1 IP) with 18 strikeouts against six walks....Named a Midwest League Mid-Season and Post-Season All-Star for Peoria....Represented the World Team in the 2015 MLB All-Star Futures Game, working 0.2 scoreless innings with one hit allowed and one strikeout for the World Team. 14 de abril de 2019 San Diego Padres llamado RHP Luis Perdomo de El Paso Chihuahuas. 23 de marzo de 2019 San Diego Padres opcionado RHP Luis Perdomo para El Paso Chihuahuas. 3 de septiembre de 2018 Luis Perdomo estado en la lista cambian a por San Diego Padres. 24 de agosto de 2018 San Diego Padres envian a RHP Luis Perdomo una asignaci&oacute;n de rehabilitaci&oacute;n a El Paso Chihuahuas. 28 de julio de 2018 San Diego Padres ponen a RHP Luis Perdomo on the 10-d&iacute;a lista de deshabilitado. Strained right shoulder. 4 de julio de 2018 San Diego Padres llamado RHP Luis Perdomo de El Paso Chihuahuas. 20 de abril de 2018 San Diego Padres opcionado RHP Luis Perdomo para El Paso Chihuahuas. 18 de abril de 2018 Luis Perdomo estado en la lista cambian a por San Diego Padres. 14 de abril de 2018 RHP Luis Perdomo estado en la lista cambian a por San Diego Padres. 23 de abril de 2017 San Diego Padres activan a RHP Luis Perdomo de la 10-d&iacute;a lista de deshabilitado. 12 de abril de 2017 San Diego Padres ponen a RHP Luis Perdomo on the 10-d&iacute;a lista de deshabilitado retroactivo al April 9, 2017. Right shoulder inflammtion. 10 de diciembre de 2015 Colorado Rockies reclamado RHP Luis Perdomo fuera de waivers de St. Louis Cardinals. 10 de diciembre de 2015 Colorado Rockies cambian a RHP Luis Perdomo a San Diego Padres for Future Considerations. 8 de agosto de 2015 RHP Luis Perdomo asignado a Palm Beach Cardinals de Peoria Chiefs. 14 de julio de 2015 Peoria Chiefs activan a RHP Luis Perdomo de la lista temporalmente inactiva. 11 de julio de 2015 Peoria Chiefs ponen a RHP Luis Perdomo en la lista de inactivos temporalmente. 11 de abril de 2015 RHP Luis Perdomo asignado a Peoria Chiefs de Johnson City Cardinals. 8 de abril de 2015 RHP Luis Perdomo asignado a Johnson City Cardinals de Peoria Chiefs. 28 de junio de 2014 RHP Luis Perdomo asignado a Peoria Chiefs de State College Spikes. 20 de mayo de 2014 RHP Luis Perdomo asignado a State College Spikes de Palm Beach Cardinals. 17 de mayo de 2014 RHP Luis Perdomo asignado a Palm Beach Cardinals de Johnson City Cardinals. 19 de junio de 2013 RHP Luis Perdomo asignado a Johnson City Cardinals de GCL Cardinals. 2 de agosto de 2012 Luis Perdomo asignado a GCL Cardinals de DSL Cardinals. 28 de mayo de 2011 Luis Perdomo asignado a DSL Cardinals.